Easily insert add-to-calendar links/button into your MailChimp email campaigns. It’s as simple as copying the links and pasting them into your content editor, with no coding knowledge required. We make it easy to give your recipients a quick and effortless way to add your events to their calendars. In your MailChimp campaign, you want to add “Add to Calendar” links/button. Click the “Create Event” button. 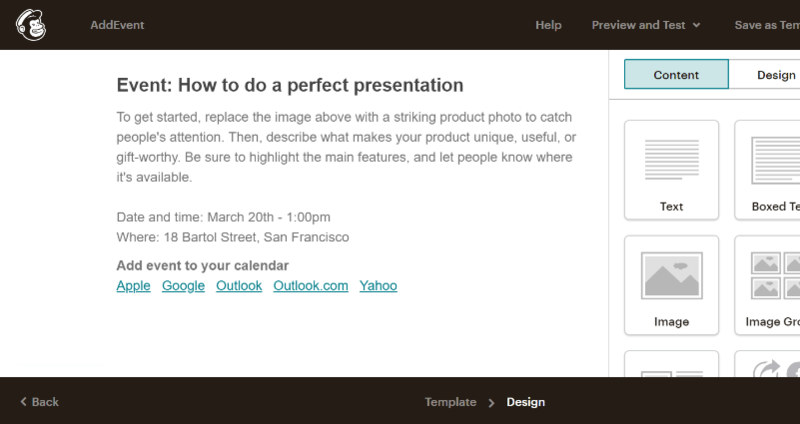 Enter your event information, click the “Create” button. When you’ve created the event, scroll down to the “Use in a newsletter” section. Now head over to your MailChimp newsletter/email content editor. Paste (CTRL+V on Windows or CMD+V on Mac) the “Add to Calendar” links you just copied into the content editor. calendars by reducing the time and effort required to do so. Our powerful add to calendar buttons are perfect for websites and landing pages. Easy to install, completely customizable, language independent, time zone and DST compatible, optimized for all modern browsers, tablets, and mobile devices. Your events. Their Calendars. Powerful Results.